Fruit Ninja is not just a video game. It is an educational experience, full of zen wisdom. Confession: I'm obsessed with Fruit Ninja. I first saw it when an addicted friend showed it to me on his iPhone. Now I have it for my phone and my iPad, and I gave it to my mom, who plays around 20 or 30 times a day. Two friends I showed it to are also hooked. Highly absorbing? Yes. Brain-numbing? No! 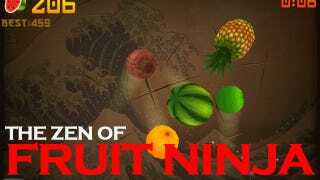 Hidden within Fruit Ninja are important teachings that will help you lead a happier, more productive existence. A note: Most of these teachings refer to Arcade Mode only. Also known as "rock what you've got" or "make do with what you have." When playing Fruit Ninja, you will have the opportunity to slice at a type of bonus banana. You never know when — or if — you'll get the Frenzy Banana, the Freeze Banana or the Double Points Banana. If you see one coming at you, don't let it get away! But if no special bananas come your way, it's not right to pout, complain or whine that your score could have been higher. Sometimes you get the Frenzy Banana; sometimes you get the Frenzy Banana twice. Some people get a great tax return, some people win the lottery. All that matters is that each of us does our best with what we have. Be thankful. The Frenzy Banana creates a chaotic fruit explosion, and it's fun to go nuts, slice as many items as you can, and rack up points. But actually playing the entire game in Frenzy mode would be tedious, erratic and exhausting. You'd also drop a lot of fruit. Lesson: It's okay to get wild sometimes, especially if you give yourself a time limit and don't "drop" too many responsibilities. Additional lesson: When life gets crazy, enjoy — but realize it won't last long. Often life feels like it's going in slow-motion, as though you're trying to get somewhere, but you're walking in glue. The Freeze Banana teaches us that reducing speed has its advantages: You can be more careful and get more done. It's easier to line up your fruit and slice through three or four at a time (extra points!). When life feels slow, get organized. Line up your duties, and see if you can't multitask and kill two birds with one stone (or three pineapples with one swipe). Every once in a while — but rarely — you'll get the Freeze Banana followed by the Frenzy Banana. This is a huge blessing, because when the fruit explosion is in slo-mo, you can slice 4, 5, 6 and 7 fruit combos over and over again, easily. Your score will get a huge, huge bump. When life throws a lot of stuff at you, try and slow down. Get your business in order. If you can, you'll find yourself in a highly coveted position: In control! In Fruit Ninja, "critical" fruits randomly appear. You don't know that they are critical until you slice them, and get the extra 10 points for doing so. In life, when we have a lot of stuff on our plate, we should remember that you never know what is "critical." Try and take care of everything you can! Whether it's mailing the rent or cutting your hair, you may not realize just how vital the task was until after it's done. Kind of a no-brainer, but there are no small lessons in Fruit Ninja! Only small pupils. From glazed-over eyes due to playing late into the night. As you know, you're supposed to avoid the bombs thrown at you while playing Fruit Ninja. But! If you do hit one bomb, and then another, and another, you'll actually get extra points for being a "Bomb Lover." In real life, some folks who have discovered the secret of commitment to suckage include William Hung, David Hasslehoff, and Ke¢ha. Bomb lovers! Points are also awarded if you fail to slice any bananas. Fruit Ninja consolation prize! Extra points are awarded for slicing the first and last fruit, and for not allowing any fruit to drop. And think of where you'd be if you were more thorough! Think of all you'd have accomplished if you'd only finished all the projects you've started in life. One trick for getting a higher score? Flip your iPad or iPhone upside down. Like anything else in life, changing your frame of reference brings enlightenment. And awesome when you slice it yourself.